Adaptive Driving Access, McAllen is the leading mobility dealer in southwestern Texas. If you need a handicap van, we've got the selection, knowledge, experience and caring attitude to help you get exactly the right accessible vehicle. We're part of the disabled community in and around McAllen and all the surrounding towns. We're happy to serve you and your family. BraunAbility is the most trusted name in adaptive driving. At Adaptive Driving Access, McAllen, we're proud to be the sole exclusive BraunAbility handicap van dealer. That means we're the place to go for wheelchair vans manufactured and modified to the highest possible quality and safety standards. We're also an authorized conversion dealer for Tuscany, El Dorado, VMI and Vision Rear-Entry vans. 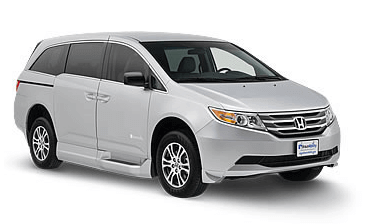 If you're looking for a new or used handicap van, selection is essential to ensure you get the vehicle that meets your individual access and driving needs. At Adaptive Driving Access, McAllen, we maintain one of the state's largest inventories. Check out our showroom and be amazed at the options available to you! We can provide you with the perfect new, used or commercial wheelchair van or truck. If you need vehicle modifications, we're the best place to go. Whether you're looking to add a ramp or lift, special seating systems, hand controls for driving or other access or adaptive driving equipment, we've got the leading products at low prices. We'll install equipment expertly and affordably. Nothing is more important to us than helping you achieve maximum mobility. Come in and talk to us to learn how we can help you maintain independence with the handicapped-accommodating vehicle you need.